Why wait until there is someone else around to toss you balls? The Heater Batter Up Solo Hitting Trainer lets you hit ball after ball without a net, without chasing balls and without having to wait for someone to throw them to you! Great for all ages, whether you play baseball or softball, develop the perfect grooved swing with this fantastic hitting training aid! 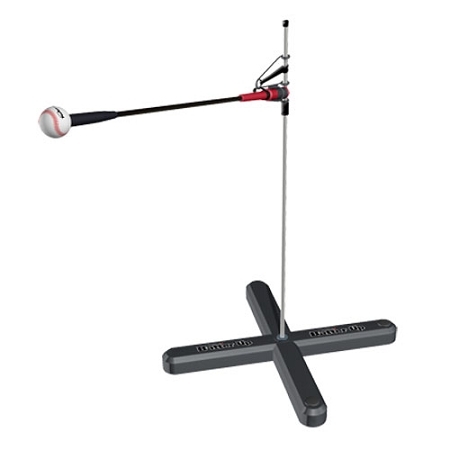 Featuring a simulated leather ball that gives you the look and feel of hitting a real baseball, the Heater Batter Up Solo Hitting Trainer is the ideal tool for developing a level swing as well as great hand-eye coordination. The spring loaded arm rotates back around after every hit, allowing you to swing and swing and swing until you can swing no more! The weighted base can be filled with sand, concrete or even water, which makes it highly portable. Practice at home and then bring it to the field and use it to warm up before heading to the plate in a game. Really two training tools in one, the entire arm and ball assembly are detachable (it is actually the Perfect Swing Batting Trainer) so that coaches can work one-on-one with players and, like all Heater Sports products, the Batter Up Solo Hitting Trainer features a 30 Day Satisfaction Guarantee as well as a One Year Manufacturer's Warranty. To ensure your satisfaction, your Heater Batter Up Solo Hitting Trainer includes a 30 Day Money Back Guarantee. Batter Up Trainers are also backed by a Full 1 Year Warranty. No matter where you order a Heater Batter Up Solo Hitting Trainer from, NOBODY actually stocks them; they all ship directly from the manufacturer's warehouse located in St. George, Utah. Therefore, the shipping time frame is exactly the same no matter what website you order from (we hope that it is this one!). Batter Up Trainers typically take 2-4 business days to ship from the time you place your order. They ship via Federal Express (FedEx) Ground and could take anywhere from a day or two to a week to get to you AFTER being shipped, depending on your proximity to their warehouse. We will notify you of your tracking number the moment we receive it from the manufacturer's warehouse. Click here to download an easy to read, printable PDF of the Heater Batter Up Solo Hitting Trainer Owner's Manual.